C-star, Shanghai’s International Trade Fair for Solutions and Trends all about Retail, has become successfully established in China as a special trade fair for retail, notching up three events now since 2015. As an official satellite of EuroShop in Düsseldorf, The World’s No. 1 Retail Trade Fair, C-star is an annual event presenting innovative products and creative solutions from international suppliers especially for the Chinese market. 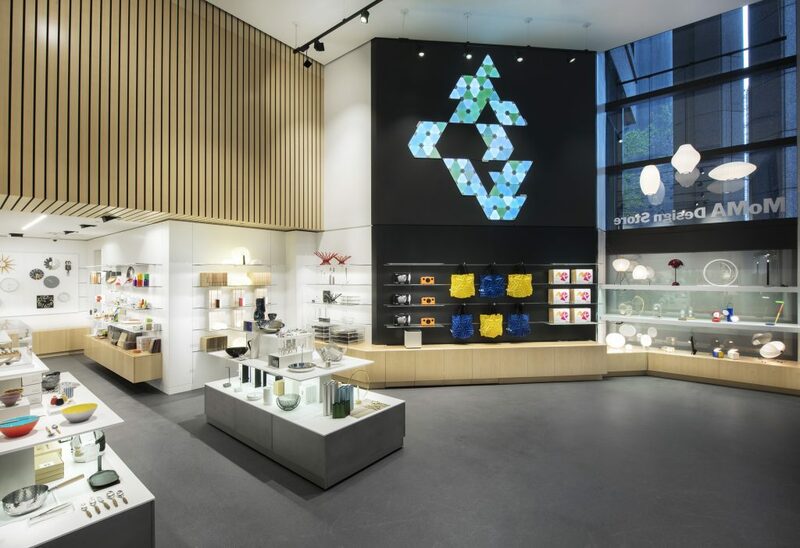 Nominated: MoMA Design Store, New York, USA; © EHI Retail Institute e. V.
Current store concepts are characterized by a mix of different colours and styles – from industrial look to country house – and a broad range of various materials. Stores create hybrid spaces, mixing traditional retail, tasteful catering, personal services, art galleries, literary readings and lots more. For this year’s EuroShop Retail Design Awards, 85 nominations were received from 27 countries. From these superb examples, EHI shopfitting expert Claudia Horbert distils the most important trends in international retail design. Wood remains the most favourite element for store construction and determines the ambiance of a store. Dark wood creates a cozy, warmer and more genuine atmosphere than the clear design language of the Scandinavian style or sharp black-white contrasts. The mix of different materials convinces by setting finely adjusted contrasts together with a creative and exceptional Visual Merchandising for a custom design of the retail space. Visual Merchandising enables a high flexibility of the space and creates the stage setting for ever-changing story-telling around curated collections. Curated retailing offers the customer a first pre-selection by grouping products across existing categories and product lines, creating new lifestyle-worlds and meeting points. Modern stores understand food service, cafés and restaurants as important parts of the shopping experience. Today they have become a commodity in modern retail spaces of nearly all retail sectors. Nominated: VÈLO7 Cycle Shop in Poznań; © EHI Retail Institute e. V.
In the food business supermarkets set the focus on freshness, local products and more personality as well as customer proximity. They present themselves as new neighborhood markets turning customers into guests. In a world of a growing competition from suppliers online, modern stores have to create unique environments that seduce, attract and entertain customers at the point of sale. Whether it is an iconic architecture, an enhancing store design, lighting or the embedding of state-of-the-art media in the shop fitting, everything has to follow a joint dramaturgy to give customers that certain kick. Thus the dovetailing of physical and online stores is generating new retail and interior design concepts. Nominated: Zealong Tea Estate in Hamilton, Neuseeland; © EHI Retail Institute e. V.
There will be more interacting applications which engage customers such as interactive fitting rooms, web bars for online selection, stock checking and ordering, social-media based customer communication, receipt-free purchasing and mobile payment for a quicker checkout process or special configuration tools to support the customers to create their personal items. To emerge from the competition as a winner, this year’s participants again had to appeal to customers with a successful combination of shop architecture, colours, materials, lighting and visual merchandising and convey an unambiguous message in relation to their product offering. On the evening of April 26th, to kick off the C-star trade fair in Shanghai, EHI and Messe Düsseldorf will grant the EuroShop Retail Design Awards to three stores with the best concepts. Source: EHI Retail Institute e. V.